Hosted by Matt Dillon, Bonnie Young, Hans Humes, MacDella Cooper and the Host Committee including: Ali Hughes, Georgie Badiel, Josie Gardiner, Mamamdou Niang, Miata Jones, Siamanda Chege, Vel Mensah and Jesper Lannung. Please click the link below for tickets and more information. “For the fiftieth consecutive year, audiences around the world will have the best seat in the house when they witness the progress that UNCTAD has made over the years and the challenges that lie ahead. The Finalists are living testimony of the impact that initiatives that support entrepreneurship can have. These include job creation, innovation, increasing the quality of life of the women and their communities and giving them a voice and an outlet to inspire others. For more information about the UNCTAD World Investment Forum, click here. New York, NY (October 8, 2014) Fashion philanthropy organization, United Colors of Fashion (UCOF) presented their 4th Annual Gala: Paper Dreams- Writing New Runways, located on 68 Lexington Avenue at the Lexington Avenue Armory. The gala began with a cocktail hour at 6:30, and then the awards and entertainment commenced at 7:30pm, with Janice Huff and Mike Ruiz as the hosts. The 4th annual gala honored Malan Breton as the 2014 Fashion Icon of the Year, Devyn as the 2014 Model of the Year, and Meck Khalfan as the 2014 Techno Innovator. “Paper Dreams: Writing New Runways” speaks to the understanding that everyone’s success stems from a dream. As young, starry-eyed hopefuls, UCOF’s students have all their dreams written down on pieces of paper, which are the incubators of their talent and ultimate success. As their dreams translate to reality, they will become the ones who change the way runways present to consumers of fashion. Be it business, production, marketing, public relations, or design, their dreams will dictate the future of fashion. Therefore, their 2014 theme pays homage to the dreams these students have put down on paper as they will it to fruition and write new runways for the future. Ciano Clerjuste is the Founder, Chairman, and President of United Colors Of Fashion, a 501 (C)(3) organization. He is compassionate, determined, and resilient, which shows through in events such as this. The program engages under-resourced youth with opportunities in fashion and exposes them to the fashion industry in its true form. This program is unique in that it is the only one in the United State that is offered to interns free of charge. In addition, the organization heavily provides financial assistance to children with HIV/AIDS in Soweto, Johannesburg in South Africa. Bisila Bokoko Embassy International (BBES) is proud to have been a part of this event, collaborating with UCOF and designer’s Agatha Ruiz de La Prada and Amparo Chorda. Bisila is the Brand Ambassador and Muse of Amparo Chorda and the Brand Ambassdor for Agatha Ruiz de La Prada. She truly cherishes both of these wonderful Spanish designers. BBES came into being because Bisila Bokoko, Founder and CEO, believes in her dreams and the dreams of others. The theme of this year’s United Colors of Fashion Gala truly resonates with this firm. If you have a goal in mind and the will to reach success, then you will see positive results. The 2014 Annual Gala & Fashion Benefit are made possible by the United Colors of Fashion Board of Directors. 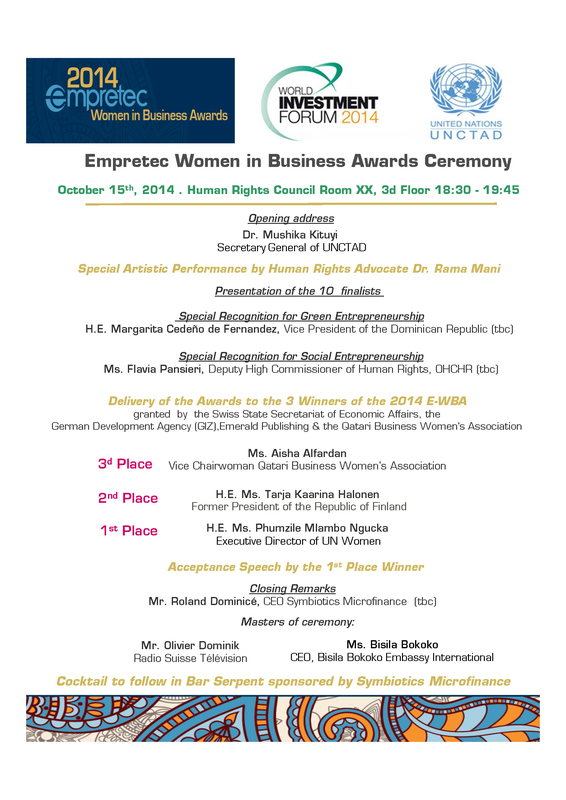 On October 15th, Bisila will be the MC for the Empretec Woman in Business Award Ceremony 2014.